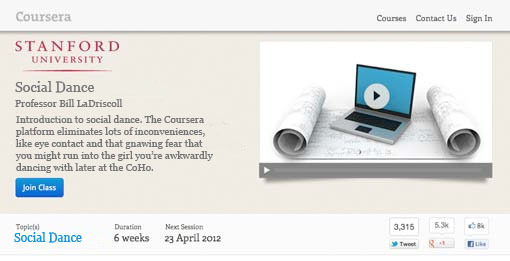 Coursera, the online education startup famous for its flipped-classroom system that gives students twice the lecture for the same number of units, announced Thursday that they will offer social dance classes on their web platform, starting in January. Coursera’s game-changing new class leverages Microsoft Kinect to simulate real-life dancing without the need for actual human contact. In a two-step process, students with a Kinect will be able to dance with a virtual partner potentially thousands of miles away over an internet connection.